A friend of mine introduced me to buckwheat grains recently. I decided to try it out myself by making a warm buckwheat and harissa salad with butternut squash and herbs. And these seeds are really healthy as well, containing the antioxidant rutin and also quite high levels of magnesium, a mineral that is vital for a healthy cardiovascular system. Buckwheat is said to be good for a healthy blood sugar balance and for lowering cholesterol. I had only eaten buckwheat in the form of soba noodles before – which is the healthiest type of noodle and a very tasty one as far as I am concerned (see Prawn Noodle Stir-Fry). 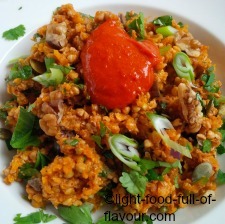 In this buckwheat and harissa recipe I am using roasted buckwheat grains (kasha), which have a lovely nutty flavour. You can buy them unroasted as well. I bought mine in a health food shop. 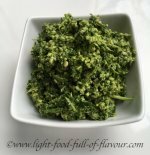 I am making my own harissa paste – it is easy to do and by doing it yourself you avoid any nasty additives and sugar which are added to so many ready-made products. It’s a great thing to have in your fridge – it will keep for a couple of weeks – as it will liven up many a different dish. 2. Place the pepper in a bowl and cover with cling film. Set aside for 10-15 minutes, until the skin comes off easily. Break the pepper open, pull out and discard the stalks, pith and seed and peel off the skin. 3. Place the red pepper and all the other ingredients for the harissa in a food processor and process to a smooth paste. 4. Place the roasted buckwheat in a large bowl and pour over enough boiling water to just cover the grains. Cover the bowl with cling film and leave to the side for about 18-20 minutes. 5. Add 2 tablespoons of olive oil to a large frying pan over a medium heat. Add the chopped onion and grated butternut squash to the pan, season with some salt and pepper and fry for about 12-15 minutes, until the vegetables have softened and caramelised somewhat. Once they are ready, stir through the harissa. 6. Fluff up the buckwheat with a fork and add the warm vegetables, herbs seeds and nuts to the bowl. Serve immediately while it’s still warm.